This entry was posted in Garden Fresh, recipes, Side Dishes, Vegetables. Bookmark the permalink. We discovered delicata squash a few years ago. What a treat! Thank you for sharing! I’m eating breakfast…but I’m already hungry for dinner! I hope you have a great Tuesday! Yum – another delish [and easy!] looking recipe. Hope I can find some near me! 107 Squashes??? Lucky or maybe not….Anyway in my allotment at the moment there is only ONE squash and I’m already planning several dishes (uhm…). I like the sweet and sour chinese inspired sauce. Monet – they have such great flavor, don’t they? We’ll make a cook out of you yet, Ali! Rita – thanks! I could never get by with only squash – I am working on getting a bunch of it cooked up and stashed in the freezer. It is so good over the long winter time! this is such an interesting idea – love it! I’ve not had the delicata squash before but they sound delicious. I’m going to be on the lookout at the local farmer’s markets for a few of these so that I can try this exceptional recipe. Thanks Jerri & thanks for stopping by! My husband teases me about my (crazy) obsession with squashes. This is one I have yet to try and now one I really want to eat. Thanks for sharing, it looks amazing! Lovely dish! I’ve not heard to delicata squash, but I’ll be looking for them. That glaze is killer – really nice combo of flavors. Thanks. 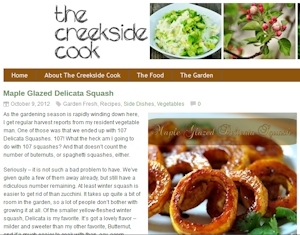 Nancy – glad to find another squash-obsessed blogger. I honestly can’t get enough of them – isn’t it great that there are so many to love? John – hope you can find some – they have them in most farm stands and even groceries around our area. Aw, thanks Brenda – hope you can find the squash, so that you can give it a try! I tried this recipe last night and loved it! I placed it along with baked pork chops and grilled asparagus and really enjoyed the meal. I’ve brought in leftovers today for lunch, so I’ll see how it reheats. Thanks! Traci – so glad that you enjoyed the recipe – thanks for letting me know. I love the idea of this – thanks! That glaze is RIGHT up my alley! The whole dish is lovely! Great colors and great flavors! Thanks Averie – we’ve enjoyed it so much this fall!